Well folks, there goes the month of June! And what a fun, and football filled, month it was! 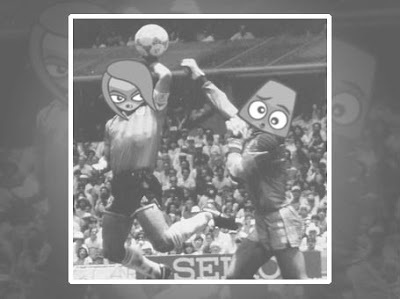 A month in which we found out how to survive the World Cup, met a papercraft Zakumi, and got to see a kawaiified footballing moment, twice! And along the way we got to meet some great designers and crafters including Yozo Craft, Knitting Dreams, and the marvellously monstrous Meep, to name but a few! And, of course, there was our monthly puzzle. Did you work out who scored the goal? Incredible! It was the Demon Mascot! And what a great shot too! Maybe we mascots should think about getting our own team together for the next World Cup! If only we had our own country! Oh well, I’m afraid that’s all for this month readers. But be sure to come back in July when we’ll have plenty more kawaii crafts and craziness for you all to enjoy! And, I’m sure a lot of you will be happy to hear, a lot less football too! Yes, it’s that glorious day from 1966 when Bobby Moore led England to World Cup victory in that unforgettable 4-2 defeat over Germany! I’m sure you remember it well! Naturally I’ve cast yourself in the role of Bobby Moore, triumphantly holding aloft the Jules Rimet Trophy for all to see! Well, I could hardly of used the Cute Mascot, could I? Hope you enjoy it! Marvellous work Charlie! And a great excuse for me to do a spot of grandiose reminiscing! Although, to be honest, once you reach my age, you seldom need an excuse for that old chestnut! OK readers, get ready for some fun! Because today I’ve got a kawaii treat for you that’s guaranteed to put a smile on everyone’s face. Well, maybe not the Grumpy Mascot, but some things are even beyond my mischievous powers :) For the rest of us however I’ve got a shop that’s packed with so many tasty treats, your hungry bellies will be fit to bursting! Ta da! 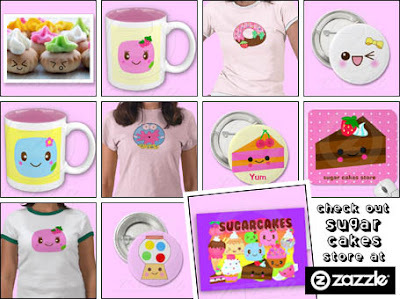 What you are looking at, my fellow followers of fun and frivolity, are just some of the sweet sensations available from the Sugar Cakes Zazzle store. I know, they are tasty looking, aren’t they? And with everything from dumplings and cupcakes to ice cream and bubblegum, this shop really does have something for every appetite! See? I told you you’d be smiling! 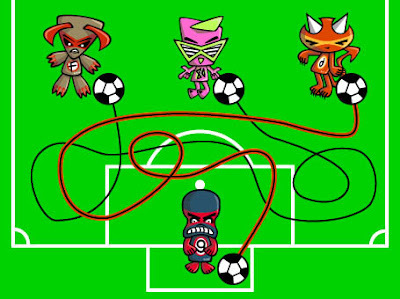 As you can see the Grumpy Mascot has got some of his colleagues together in an attempt to show off his goal keeping skills. Apparently he reckons he can stop a free kick from any distance - quite the claim, if you ask me! But wait! It looks like one of his fellow mascots has bested him! 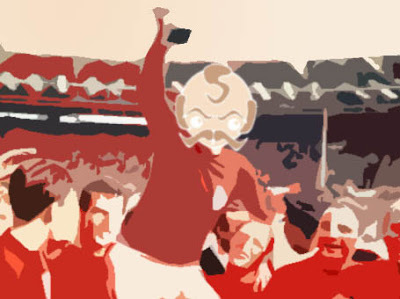 The question is… which mascot managed to score the goal? Was it the Fierce, the Eighties, or the Demon Mascot? Can you work it out? The answer, as ever, will be revealed in this month’s monthly round-up! It’s a picture of the Lovestruck Mascot - the very cute and kawaii Lovestruck Mascot, I hasten to add! - having a go at a game of football. And, as I’m sure you can see, she seems to be finding the whole experience completely and utterly boring! 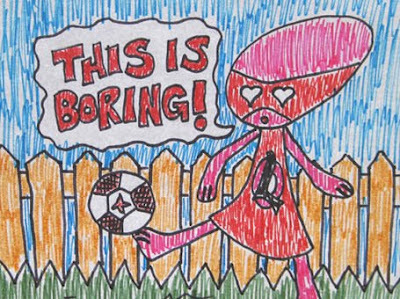 So much so, in fact, that she can actually be seen to say “This is boring!” Hmmm? I wonder what it can all mean? Any ideas Ed? Wow! You’re right! How could I have been so short sighted? There I was getting so caught up in the 2010 World Cup, that I completely forgot to mention the 2011 Women’s World Cup! Rest assured Vanessa that this error will be well and truly corrected when the competition begins in Germany on June 26th 2011! See what I mean? The teddies you are looking at, and undoubtedly saying “awww” as you do so, are the creations of the amazingly adorable Knitting Dreams at Etsy. 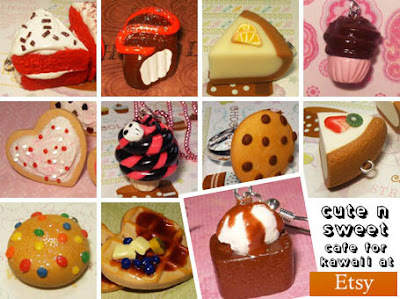 And what incredibly cute creations they are! In fact, they’re so cute, you might just have to pick up a few and have yourself a good old fashioned teddy bear’s picnic! Let’s all just hope you get some summer sunshine to go with it! 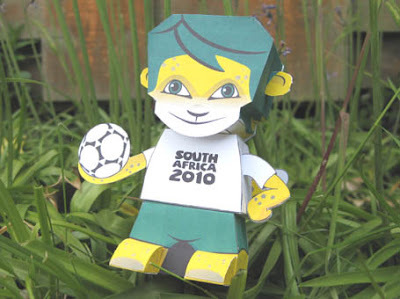 What you are looking at is the fantastic papercraft Zakumi created by Ruang Antho to celebrate the 2010 World Cup. And the best thing about it is… you can get one too! Simply head over to Ruang Antho’s blog, download and print off his design. And with some scissors, glue, and a little bit of patience, you too can have your very own Zakumi paper model! P.S. 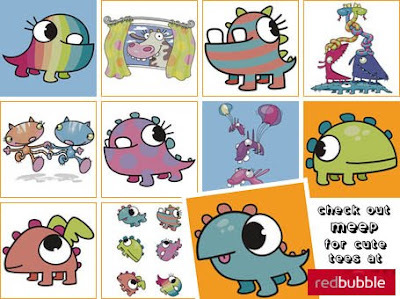 Be sure to check Ruang’s other crafting goodies too! You wont be disappointed! This, my crafty connoisseurs, is the fantastic Yozo Craft! I know, it is sweet, isn’t it? 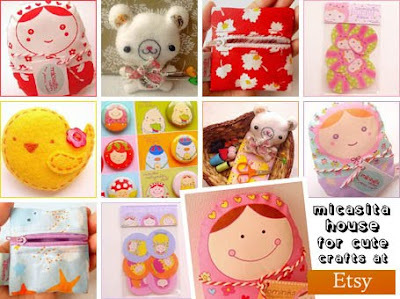 Yozo Craft specialise in super cute sewing and craft supplies from Japan, as well as bringing you some truly adorable stationery and handmade goodies along the way! 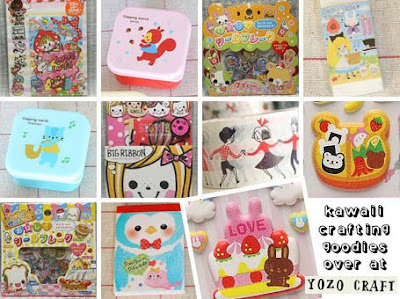 With everything from fabrics and tapes to erasers and folders, not to mention worldwide shipping, Yozo Craft truly is a one stop shop for cute crafters everywhere. Enjoy! Help! A couple of months ago I asked out a boy at school I liked, and thankfully he said yes :) But unfortunately, like most boys, he has one major flaw - it’s called football! Up until now it hasn’t really been a problem because I’ve got a Saturday job that gives me the perfect excuse to avoid going to matches with him as he cheers on his team and acts all bloke-ish, or whatever boys do at football games! But with the World Cup starting in a couple of days I fear that my luck is about to run out and, horror of horrors, it looks like I’m going to have to watch a football match with him! I asked my Gran for some advice about what to do, and she reckons I should fake interest to keep him happy. My Gran’s got six marriages under her belt, so I’m guessing she knows what she’s talking about! The problem is I don’t know anything about football, and haven’t got a clue what to say when watching a match! Can you help me? 1. “This game could really do with a goal.” A phrase to use between the 25th minute and half time when a score remains 0-0. Or throughout the entire 90 minutes when you get to the knock out stages, as anyone who watched 2006 World Cup will doubtlessly agree! 2. “The next goal’s going to be crucial.” Use this one when there’s a two goal difference in the fist half, or a one goal difference in the early stages of the second! But be sure to an eye on the clock! Uttering this anytime after the 65th minute could see your cover blown! 3. “There’s still time.” A calming phrase used to bring supporters hope when their team goes a goal down at any stage within the first 80 minutes. Any such declaration afterwards is generally considered an act of wishful desperation and denial! 5. “That’s football.” A generic phrase of such epically meaningless proportions that it can be used as both comment and response throughout the entire World Cup Tournament. If in any doubt at all, this is the phrase to use! What at first seems likes a bargain may turn out to be major financial blunder. Besides, can you really see yourself using a gym five times a week? Now is the time to learn the trumpet if you’ve been thinking about learning the trumpet. If you haven’t, then don’t bother! Avoiding all things football related is the key to surviving this month unscathed. So get ready for a disappointing month! Sorry! Switching off electrical equipment at night is a good way to save energy. Switching off your phone mid conversation is just rude. Remember this difference! Now’s the time to fix that belt you’ve been meaning to fix, unless you enjoy embarrassing workplace incidents! You have been warned! Listening to whale song may help you relax, but is it really conducive to dining? Bear this in mind when planning that dinner party! An unexpected guest has the potential to ruin an otherwise perfect night in! Best to call ahead and let them know you’re coming! An embarrassing incident from your past will come back to haunt you this month! So start thinking up those evil twin excuses right now! Oh oh! Looks like your favourite TV show is about to be postponed and rescheduled! Well, what did you expect? It is World Cup time! The phrase “the best things in life are free” does not mean its okay to steal stuff! Just letting you know before your boss does! Saving money on shorts by cutting the legs off your trousers may seem like a good idea, but it’s not without its consequences! Think on! Rolling around on the floor with a ball of wool while purring is only cute when kittens do it! Remember this to avoid embarrassment!